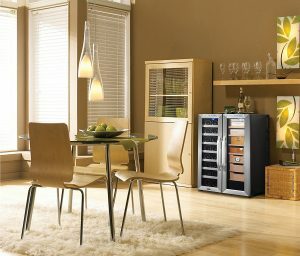 Whynter CWC-351DD is a stand-alone design, stainless steel, compact thermoelectric (120V) wine cooler and cigar humidor center, with a 3.6 cubic feet capacity. 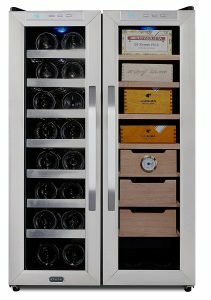 You can fit in 16 standard sized Bordeaux style 750ml wine bottles in the wine cooler and more than 350 cigars in the cigar humidor. Black and stainless steel Whynter Cooler + Humidor looks nice and modern and has a beautiful freestanding set-up. It weighs 69.5 pounds as a heavy-duty product and measures 21 x 33 x 21 inches- is good for those without much space. It includes a double pane glass door, 11 shelves and 3 Spanish cedar drawers that are detachable and slide out easily. There are a hygrometer and a humidity tray inside so you can maintain the interior humidity level. This is a thermoelectric type cooler without a compressor and with auto defrost function. This model doesn’t include a lock if you’d rather get one with. Whynter CWC-351DD is a dual zone fridge and humidor so both sides have their own thermostat so you can adjust the temperature between 46 and 66 degrees Fahrenheit on its LED display. It doesn’t go below 46 degrees (the optimal temperature) if you prefer your white wine cooler on those hot summer days. And you may want the temperature above 66 degrees for your cigars but you won’t get that here. As a multi-functional cooler, you can put your other beverages like water, soda or beer cans and bottles. And as a great cigar humidor and storage unit, the flavor of your cigars will be maintained with the pests or any other bad elements kept out. The thick Spanish cedar wood gives out a subtle aroma which helps keep the insects away. This is a CFC-free cooler it is friendly to the environment. It doesn’t have any moving parts and runs without vibrations and quietly at all times, without also a compressor making cycles. The humidity is kept even throughout the interior of the fridge thanks to the fan-forced circulation. You may want to clean and season the humidor section before placing your cigars. You may want to clean and season the humidor section before placing your cigars. 14 x 750ml regular sized and shaped wine bottles can be put on the racks and two bottles at the bottom. Both sides are 13 inches wide and 7.75 inches wide. You can contact their customer service team on customer.service@whynter.com if you have any questions or need assistance. They are available on weekdays between 8.30am and 4.30pm. It is not a cheap product but overall it is a great looking product with a premium feel, is well constructed, and runs quietly and efficiently.